Plumber Builds World's Fastest Toilet! You gotta love this! 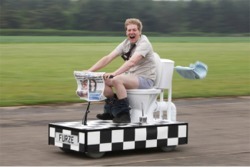 Englishman Colin Furze, 33, has spent four weeks building the gas powered toilet which boasts a powerful 140cc motorbike engine and can travel at 55mph. The high-speed toilet has been fitted with a button on the handle bars, so it can be flushed on the move, and a clip so he can read his favorite newspaper. ‘It is quite scary to drive as the water in the toilet makes it very top heavy and I get wet when I go over any bumps,’ said Colin, from Stamford in Lincolnshire, England. ‘The toilet seat is also quite slippery so it’s hard to stay on and stop myself from sliding off when I go fast. It’s also pretty tricky to steer.’ The plumber regularly gets called out to fix and install toilets so decided to build the contraption as a bit of fun. Four electronic gears have also been fitted to the handlebars, while a towel rail and toilet roll holder have also been installed. ‘I’m a plumber and I’m used to putting toilets together so I thought I’d try the challenge of making the fastest,’ said Furze. ‘I’ve seen people build them before using mopeds, but I’ve given mine a more powerful engine so it can go much faster.’ The previous fastest toilet was the Bog Standard, which could travel at 42.25mph and was unveiled in Milan, Italy in March 2011. So if he were able to sell a bunch of these, would that make him “flush” with success? Just wondering.